Up-cycling proposes the transformation of the Detroit superior Bridge from a car oriented single-function infrastructure to a recycling center with multi-functions; such as: a pedestrian connection, public space and energy generating plant. The bridge will provide engaging educational spaces for better pedestrian environments by showing sustainability and usability of recycled glass. 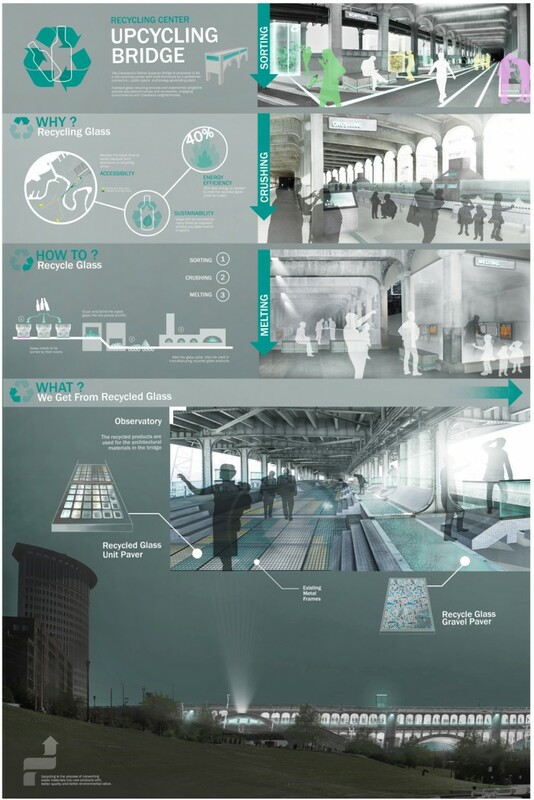 For experiential qualities, exposed glass recycling processes with dynamic programs are planned along the bridge. For accessible environments, more entrances at the edges of the bridge and elevators near the Cuyahoga River are designed. The elevators will improve several factors: the pedestrian circulation of the bridge, the ground level related to settler’s park station and it is also used for shipping / transportation of the recycled products. 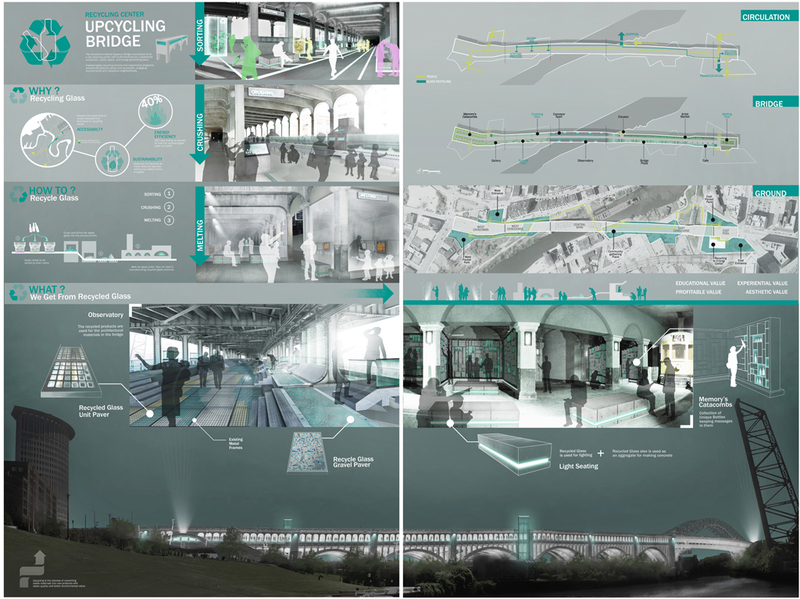 The products from the recycling can be used for glass market, artist’s works as well as for the architectural materials and lightings in the bridge. Furthermore, an energy recycling plant is also recommended to power the glass recycling system by burning solid waste from the city. 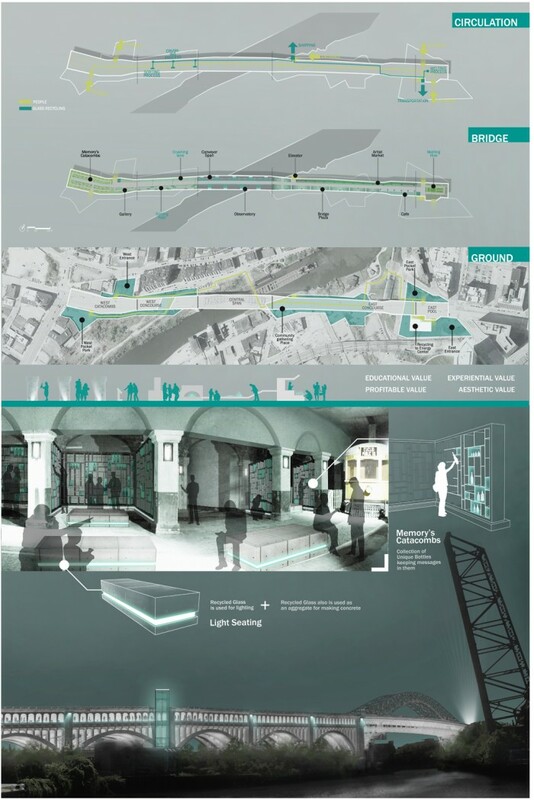 The bridge will become a healthy public space with environmental, economic, and educational values for Cleveland city.